new Staining of double-stranded DNA: YOSeta-1 is a cell-impermeant fluorescent dye used for staining of double-stranded DNA (same dye as YOYO® 1). 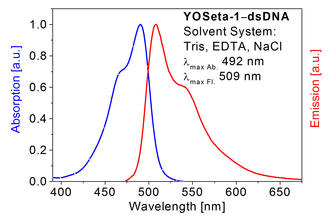 The free YOSeta-1 dye has a very low fluorescence quantum yield but the QY increases several thousand times upon binding to double-stranded DNA (see specs sheet). The probe is available as a 1 mM solution in DMSO. Measurement of changes in lipid bilayer hydration in cells: Square-670 is as an effective red emitting fluorescent probe for examining membrane-related processes, e.g. drug-influenced changes in bilayer hydration [18​]. 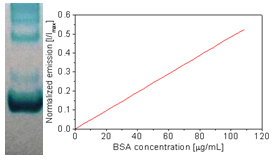 Protein analysis: Dyes such as Square-655 and Square-680 exhibit a substantial fluorescence intensity increase (up to 190 times) in the presence of BSA. Fluorescence enhancement of the dyes in the presence of other albumins (HSA and ovalbumin) is lower (40 times). The large fluorescence enhancement in presence of proteins makes them valuable dyes for the visualization and quantification of proteins in gel-electrophoresis applications. 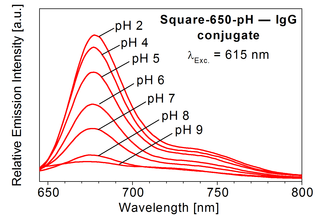 Fluorescence intensity of Square-655 vs.
Square dyes are the most sensitive dyes on the market for the detection of proteins. The protein-bound forms of Square dyes exhibit absorption and emission maxima between 640 and 750 nm, very high extinction coefficients between 104,000–208,000 M–1cm–1 and quantum yields as high as 80%. Squaraine-Rotaxane imaging probes for live and fixed cells: Our fluorescent rotaxane probes exhibit extremely high chemical and photochemical stability and are therefore well suited for imaging applications. They also exhibit very high 2-photon action cross sections in the order of several thousand GM. SeTau-633 is a carboxylic acid ethyl ester derivative that passively penetrates cell membranes. Once inside these residue are hydrolyzed by esterases thereby forming carboxyl groups that are cell-impermeable. SeTau-647 is a highly water-soluble fluorescent probe with several negative charges and therefore will not passively penetrate the cell-menbrane. This probe is very photostable and has a quantum yield of 60% in water. [B.D. Smith et al. Squaraine Rotaxanes: Superior Substitutes for Cy-5 in Molecular Probes for Near-Infrared Fluorescence Cell Imaging. Angew. Chem. 2007, 119, 5624 –5627]. 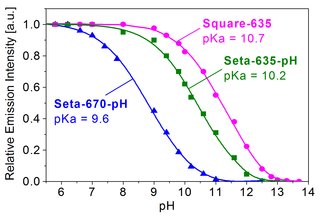 pH-measurement in cells: Probes such as Square-650-pH-Carboxy exhibit pKa’s in the physiologically relevant pH range and are therefore useful to measure the intercellular pH changes in cells. For more information about this dye we refer you to the specs sheet of Square-650-pH-Carboxy and the published literature. Additional pH-probes with pKa's in the alkaline pH-range are listed under pH-sensing applications. 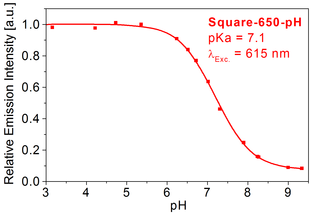 Albumin Determination: K35 and Square-655 are a fluorescent probes for determination of albumin binding sites in plasma and serum [19, 20]. 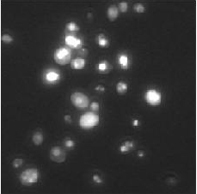 The fluorescence intensity of these probes significantly increases in presence of albumin. Cryoprotectors (CPs) are important reagents that help to prevent biological matter such as blood, tissues and cells from degradation during low-temperature storage. Fluorescent dyes are useful tools to investigate the interaction of CPs with biological species. Long-term and low temperature storage of cells is an important process for biomedical research and transplantation medicine. Biomembranes are cellular structures that are strongly affected by the freeze-thawing process. The freeze-thawing experiments with yeast cells using cryoprotectors have demonstrated that 2-DAB and 3-DAB are fluorescent probes that enable not only to distinguish damaged from undamaged cells, but also allow quantitative estimation of the extent of damage by the cryogenic treatment. 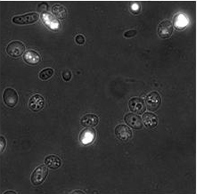 These fluorescent probes are therefore very useful to quickly assess the effects of cryopreservation on cells using fluorescence imaging. 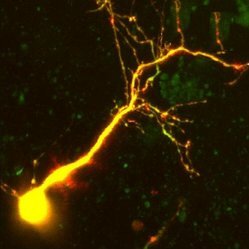 See also Fluorescence Imaging, NIR Fluorescence Imaging and Fluorescence Lifetime Imaging.